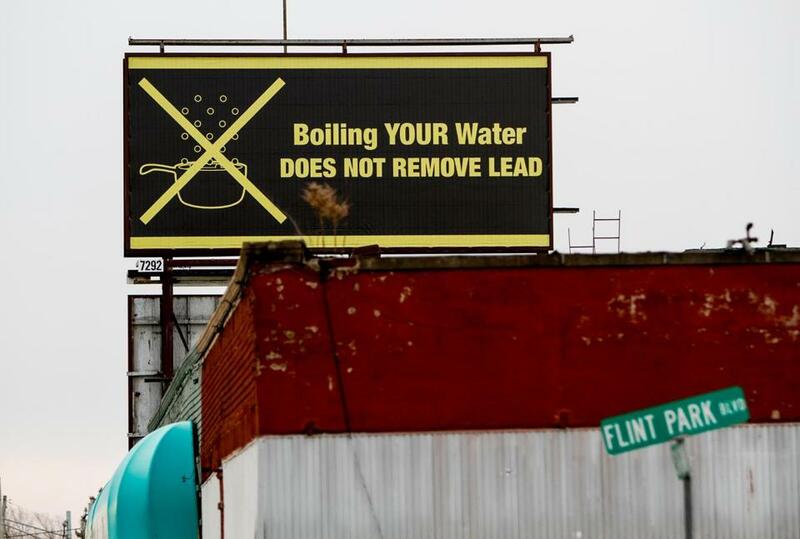 For weeks, the tragedy of the drinking water contamination in Flint dominated the news. Pictures of people holding containers of brown, cloudy water forced us to confront the reality that not everyone in this country has access to safe drinking water. Clean water is essential to public health so it makes sense that we ask ourselves, could this same problem happen in New England? Let’s start by looking at how the situation in Flint arose. The city’s water treatment plant was state-of-the-art in the 1950s, but by 1967 Flint had switched to buying water from Detroit’s water department. In 2013, Flint voted to switch its water supply to the newly formed Karednondi Water Authority. But that project, which involved building a pipeline to Lake Huron, would not be completed until 2016. For economic reasons, Flint reactivated its long-mothballed water treatment plant in 2014, using the Flint River as the source. Over time, deposits form inside pipes through normal chemical interactions with drinking water. The switch back to Flint River water disrupted the established pipe deposits, which were in a stable condition after almost 50 years of exposure to Detroit water. This, in turn, accelerated the corrosion of old lead pipes in Flint’s water system, and affected both the color and odor of the water. No one had foreseen how quickly these changes could take place. Flint’s disaster points to weak links in the otherwise remarkable chain of regulations and infrastructure that protect our water. The National Academy of Engineering counts drinking water systems as one of the greatest engineering feats of the 20th century because they have reduced disease and increased life span. Yet, recent EPA studies suggest that as many as 16.4 million Americans suffer acute gastrointestinal illness from tap water each year. The CDC, in 2010, reported an average of 25 waterborne disease outbreaks per year in community water systems. These findings highlight the widespread problems in our nation’s water systems. Aging water pipes may corrode. Leaking pipes can admit wastewater from adjacent, leaking sewer lines. Biofilms inside pipes can harbor water-borne microbial pathogens (legionella, for instance) or nitrifying bacteria that speed the decay of disinfectants. The essential disinfectants themselves can generate harmful byproducts. The latter happened in Flint, where ferric chloride was used to control the organic matter that forms disinfection byproducts. The increased chloride in the water increased the rate of lead corrosion. Ten years ago, a similar lead episode occurred in Washington D.C. The chemical interactions in water treatment and distribution are complex, and the effect of changes in water chemistry cannot always be fully anticipated without pilot studies. The root cause of the problems in Flint and Washington is that old lead pipes remain in use, primarily in the service lines of individual consumers. In Massachusetts as well, as the Globe recently reported, a small number of communities have substantial numbers of lead pipes still in service, with the top five ranging from 11 percent to 46 percent of customers. The New England area has been aware of the problems of lead in drinking water since the late 1970s. Many large water utilities and authorities, such as the MWRA, have had aggressive programs to identify and replace lead pipes, and lead levels dropped significantly from 1992 to 2015. Other large water utilities in New England have taken similar steps. But, small water utilities may lack the resources to have such aggressive efforts or even to fully investigate potential water quality issues on those rare occasions when changes in water sources and treatment are necessary. Most Massachusetts residents get their water from a public utility, but about 8 percent rely on private ground water wells. In Maine, New Hampshire, and Vermont, private wells provide a much larger percentage of household water. Ground water brings different challenges, including naturally occurring minerals, such as arsenic, and potential contamination from nearby commercial or farming activities. For example, arsenic levels well over EPA standards have been found in some areas of southern Maine, and concerns about resulting health effects have been raised. Local boards of health, rather than the EPA, regulate ground water, and individual consumers are responsible for testing their supplies periodically. The lynchpin of our safe drinking water is our water infrastructure, which is vast but often not well kept up. The country has a massive legacy of deferred maintenance on the 2 million miles of water mains. These aging pipe networks suffer more than 700 breaks per day, with daily water losses exceeding seven billion gallons, according to the American Society of Civil Engineers. In 2011, EPA estimated that water utilities would need to invest $247.5 billion to upgrade these systems over the next 20 years. In Massachusetts, the Water Infrastructure Finance Commission in 2012 reported a $21.4 billion funding gap over the next 20 years for water and wastewater systems. Governor Patrick signed legislation in 2014 to provide financing to communities trying to close this gap. In fact, Massachusetts has long been a leader in water safety. Detailed study of our water supplies began in the 1870s. Research at MIT supported the creation of the first state drinking water standards in Massachusetts. In 1886 the Legislature passed “An Act to the protect the purity of inland waters,” and the Massachusetts State Board of Health established the first test plant for drinking water purification and sewage treatment a year later. The first national drinking water standards did not follow until 1914. Flint is the latest is a series of wake-up calls to reinvest in our water infrastructure. Access to clean drinking water is widely viewed as a basic human right, and the importance of safe water to public health cannot possibly be overstated. For these benefits to be sustainable, the price of water should reflect the real costs of maintaining our water systems. Otherwise situations like Flint can and will happen again, perhaps even in New England. John H. Lienhard V is a professor of Mechanical Engineering at MIT and director of the Abdul Latif Jameel World Water and Food Security Lab. Windsor Sung was a senior lecturer at MIT and recently retired from the Massachusetts Water Resources Authority. Andrew J. Whittle is the Edmund K. Turner Professor in civil and environmental engineering at MIT.